More and more companies are looking for different ideas to make their events stand out from the crowd. If you have a corporate event coming up and have been left with the task of finding the right entertainment for the occasion, it can sometimes be a daunting task. Look no further: EVANS plus EVANS can create excitement during your special event, whether it’s a Company Christmas Party, retirement or PR Event, Dinner & Dance, or a Company Birthday. The audience gets a chance to laugh, see some amazing mysterious tricks, and have an exciting and great time. Corporate magic adds sparkle and life to your evening - Entertainment that will leave your guests spellbound. Close up magic is something that has to been seen live, right in front of your eyes. Have your guests entertained at your corporate event, perhaps during the drinks reception or around the tables beween courses. They will love and remember the magic for a long time. So often, when the dinner and speeches are over, the music starts, but most guests find it too early to start dancing. Now is the time to wow your audience with a Comedy Magic Show that will get everyone amazed, laughing and entertained. The show includes fast-paced magical routines, many performed to music, as well as audience participation, giving your guests a chance to be a part of the show. It is primarily aimed at Adults, so you know it’s not going to be cheesy! · A 30/45/60 minute show. · Or both - Close-up and a show. 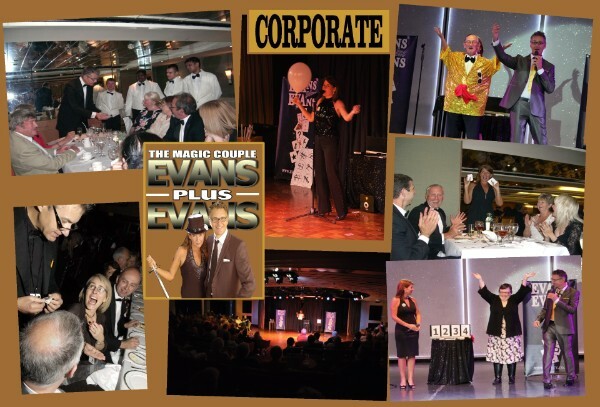 EVANS plus EVANS have been providing this type of entertainment for many years and have found it to be a perfect crowd pleaser for Company Events. They have performed their incredible Magic on many Cruise Ships, on land in Cyprus, Jamaica, Cuba & of course, the UK - Including the Bank of England, Woburn Abbey, Hilton Hotel, The Houses of Parliament, The Priory Clinic and even performed on BBC1 and not forgetting entertaining British troops overseas. Now it’s your turn to experience the showmanship of EVANS plus EVANS. Why not find out if they are available for your function.